The garden is brimming with an energy right now. Few things are in full bloom, but so many plants are swelling with buds. The first couple of butterflies have returned. I've seen them flitting about in a frantic pattern, desperately looking for wide-open blooms dripping with sweet nectar. Soon, dear butterflies, soon. There should be something good in the next week or so, and just in time for another round of Garden Bloggers' Bloom Day. This photo is a preview of coming attractions. Can you guess what it is? Christa, any chance those are strawberries? Regardless, it's a very cool photo! My mind draws a blank, but that is a pretty picture. My guess would be something in the Borage family of plants? You aren't going to make us wait until Garden Bloggers' Bloom Day on the 15th to tell us, are you?? Is it borage? The fuzzy leaves and flower heads look like borage to me, although the color looks a little more purple than I remember it to me. Anyway, that is my best guess. It is a beautiful picture. Nicely done. Good guesses. It is actually comfrey. 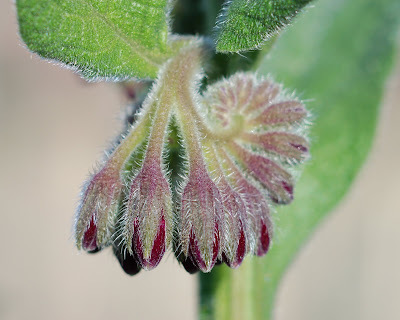 Yes, comfrey is in the Borage familiy of plants. They all have that distinctive flowering form. It's lovely! I saw the mushroom soup recipe...thanks! I dont know, but the leaves and flower heads look pretty.Am sure you will tell us all soon.